Walter V. Davidson House (1908), 57 Tillinghast Place, was designed by Frank Lloyd Wright for another Larkin Company executive. Most ceilings in Wright houses are relatively low, but in this residence, Wright made the living room two stories high. To add to the room's spaciousness and light, he added a huge, two story bay window at one end and clerestory windows along the north and south walls. Wright liked low or flat roofs and skylights, which often leaked. From one of Wright's buildings at Florida Southern College, President Ludd Spivey wrote, "The skylight keeps leaking and I have water all over my desk. What should I do?" Wright wrote back, "I guess you are going to have to move your desk." At the Tulsa home for Wright's cousin, Richard Lloyd Jones, the flat roof leaked in a rainstorm, and Mrs. Jones commented, "That's what happens when you leave a work of art out in the rain." Davidson, fortunately, had no such problems. 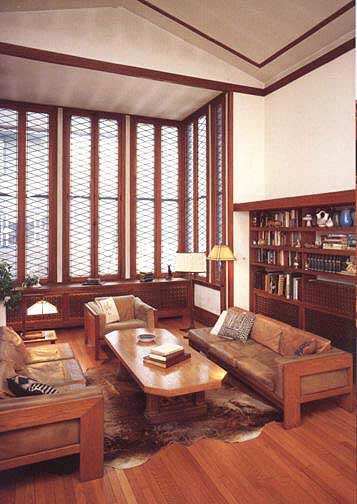 Above photo: Unusual for Frank Lloyd Wright, he designed a two story, cathedral ceiling living room for the Davidsons. To enhance the room's light even further, he created a two-story bay window at one end of the room. The furniture, also, was designed by Wright. The person singularly responsible for all of the Frank Lloyd Wright structures found in Buffalo is Darwin D. Martin (1865-1935), who was secretary of the Larkin Company, a large mail-order soap and housewares firm in the city. Martin, along with Elbert Hubbard, another top executive in the company (later of Roycroft fame), and John D. Larkin, president, conceived many innovative ideas to stimulate sales by offering an endless variety of premiums. Martin, who started to work for Larkin's company at the age of 4, became a particularly effective and valued executive in the company. His innovative efforts included the invention of a card -file system that revolutionized accounting procedures not only at the firm but throughout American industry . The immense success of the Larkin Company led to the need for a new administration building at the turn of the century. During Christmas 1900, Martin visited his brother in Oak Park, Illinois, who took him to see Frank Lloyd Wright's home that Wright had designed for himself. Martin was instantly impressed with Wright's work and became an enthusiastic life-long supporter . In 1901, Martin persuaded Larkin to commission Wright to design the new office building that the company needed. It was truly an advanced office building, incorporating many innovative features, such as central air conditioning. Unfortunately, the magnificent structure, which would today adapt easily for many uses, was demolished in 1950. Martin also hired Wright to create a fabulous residence for his own family on land he purchased along Jewett Parkway. That project led to two additional Wright-designed houses on Martin's land: the charming gardener's cottage and the George Barton House for Martin's sister, Delta, and her husband. The Jewett Parkway complex also originally included a greenhouse, two-story garage and stable, and a conservatory connected to the main house by a long pergola. Martin's enthusiastic initiative inspired a fellow executive at Larkin, William R. Heath, to have Wright design a house on Soldiers Place for him and his wife, Mary, who was the sister of Elbert Hubbard and Mrs. John D. Larkin. Still another Larkin Company top manager, Walter V. Davidson, decided to have a home at 57 Tillinghast Place done by Wright in 1908. Completing Wright's architectural contributions to the Buffalo landscape was the summer house, Graycliff, that he designed for Darwin Martin at Derby on the south shore of Lake Erie in 19~7. If events had turned out differently, there would be a final Frank Lloyd Wright structure in Buffalo today. Darwin Martin commissioned Wright to design an appropriate monument for a family lot that Martin had purchased in Section H of Forest Lawn Cemetery. Wright created a flight of shallow stone steps, under each one of which was an individual burial crypt, leading to a tall family monument at the crest of the gradual slope of the lot. Martin was delighted with the design, but thinking it would be expensive and not a sound investment, nicknamed it "The Martin Blue Sky Mausoleum." Martin probably would have been happy to pay the cost of constructing the terraced memorial, but the plans were completed just weeks before the 1929 stock market crash, and Martin's fortunes evaporated shortly thereafter, so neither he nor any member of his family buried in the lot today has any marker whatsoever, It is also unfortunate that the only cemetery monument that Frank Lloyd Wright designed was never built.